REMEMBER TO PRAY! 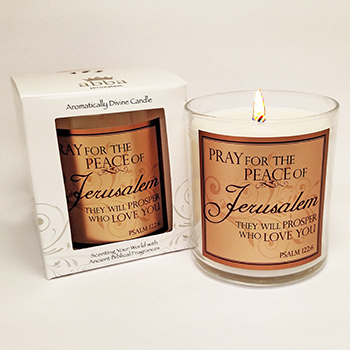 The commandment to "Pray for Peace of Jerusalem" is the focus of this compelling Scripture candle, with the promise offered "... they will prosper who love you". (Psalm 122:6). Offered in Abba's signature FRANKINCENSE & MYRRH fragrance, this 3"T glass container candle is hand-poured with our eco-friendly soy blend wax. Approximate burn time of 26-30 hours, 8.7 oz by volume.